I have a love for detective stories. My favourite tv programs tend to involve mysteries and detection. As I child I was not a great reader of fiction and yet I loved Agatha Christie. Now don’t get me wrong I did read, just not fiction. I rarely read do even today. Why I am not wholly sure, I know I would benefit from doing so. That said when relaxing I do like to watch detective series, new and old. I’m just as happy watching “Murder She Wrote” as I am watching any of the high tech modern series. I’m just as happy watching Basil Rathbone as Sherlock Holmes as I would be watching “The Code” Last year I fell in love with “The Miss Fisher Murder Mysteries”, which is a modern historical Australian series, set in the inter-war years, a kind of attractive and daring cross between Miss Marple and Jessica Fletcher. I also recently discovered a wonderful board game “Baker Street” based on Sherlock Holmes, myself and Sue had a lot of funny playing this a little while back. There is something in the searching for clues and answers and coming to conclusions that I suspect I love in these books, films and activities. I know I am not alone. Now the thing I love about all these detective characters is that they pay attention. Yes they look for clues but the key is that they pay attention to the people around them. The classic example of this is of course Miss Marple. The key to her detecting was in her paying of attention and her simple down to earth understanding of people, which she had developed during her time growing up the village of St. Mary Mead. Her gift was to see things in seemingly unique ways and her ability to connect the details and stories together and relate them to people she had known during her long life. She would hear the details of a murder and say something like, “That reminds me of poor Mr or Mrs so and so …” And how this little problem that they had faced or had caused would be related to the murder. 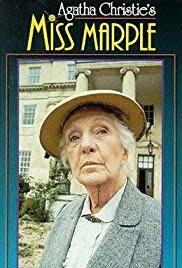 Miss Marple paid attention to people. She also paid attention to the world around her, connecting it all together. To me this is the key to spiritual living, to pay attention, to make connections and then to put them into practical application. To not merely ask questions of life but to see the connections. The key was not to merely ask questions and search for answers but to piece it together and live them as a conclusion in life. 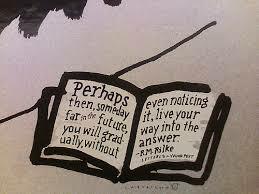 The key is to do as Rilke suggested “To live the questions” and in so doing you might just live your way into the answers. This is done in our very human and real lives; it is done by paying attention to one another and by paying attention to life. One of the groups I host is “Living the Questions”. Each month we explore and attempt to bring to life the questions of truly living. It has been a joy and blessing to be part of this these last few years, it has certainly transformed me and I have witnessed this in others too. The inspiration for the group’s title come from a favourite passage from “Letters to a Young Poet” by Rainer Maria Rilke. In it the poet Rilke writes a letter to his protégé the 19 year old cadet and budding poet Franz Xaver Kappus making a beautiful case for the importance of not merely asking questions, but living them, while embracing uncertainty and allowing for the development of intuition. To me this is what it’s about, to seek and struggle and to live the questions themselves. We need to do more than just ask the questions. You have to live the questions themselves you have to experience them and then somewhere in that struggle an answer may well be revealed, or maybe not. Either way I am convinced that by doing so we will live purposeful lives for the good of all. If we can learn to not just ask, but live the questions now we might just perhaps one day in the future, almost without noticing it live our way into the answers. This though will only come in and through life itself, through paying attention to all around us, for all life is animated by the same spirit. Now living the questions, in the hope of one day you may live your way into the answers is not merely about logic, its not just about thinking your way into life. Actually if you live purely by your mind, your logic. you can miss so much. 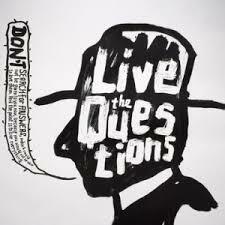 To live the question is a form of artful living, it is deeply creative in fact. My favourite detectives, usually the female ones all use intuition and emotion as an element of their questioning. Another favourite of mine is Leroy Jethro Gibbs from NCIS, who always uses his gut. 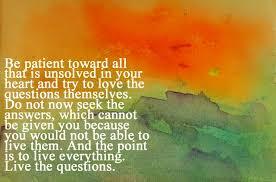 To truly live the questions requires us to live fully in our bodies as much as our logical minds. We Unitarians can sometimes be accused of being too logical and to disregard our intuition. I do not see this as a fair criticism. Yes we are encouraged to doubt and ask questions, but we are also encouraged to use our whole human experience and not to merely worship the mind as if it were God. To truly live the questions and thus therefore one day hopefully live our way into the answers requires us to pay attention, to pay attention to everyone and then relate it our own experiences, like Miss Marple did. To find the answers she paid attention to life, to other people and to her own intuition. She lived her way into the answers by merely paying attention. The problem is that paying attention is not always easy. It is easy to be distracted and sometimes it hurts too much to pay attention. It certainly does for me at times. I noticed the other morning that I was paying attention. I noticed while sitting in meditation and then listening to others that life was touching me deeply and as a result my mind became clearer. I heard the language of the heart touch me deeply as people spoke and yet at the same time I could hear, clearly hear, all the sounds of life outside. I could hear the traffic, I could hear the dogs barking, I could hear the birds singing and I could hear the rain falling, as I did the words shared penetrated me more deeply. I listened to their questions and as I did I began to live my own and in doing so I knew I was on my way to live my way into the answers. And what is the answer you might ask? Well the answer is to pay attention, pay attention to everything. In so doing you will begin to live your way into the answers.